September marks the beginning of fall and of college recruiting season at Technomics. Each year, we recruit a new class of talented associate analysts from Virginia Tech and Penn State. CEO Rick Collins takes a personal approach to recruiting by attending information sessions at the fall career fairs. Our entry-level associates require a Bachelor of Arts (BA) or Bachelor of Science (BS) with a minimum of 24 credit hours in quantitative courses in the following disciplines: economics, engineering, mathematics, operations research, or statistics. Candidates must possess minimum and overall GPAs of 3.0 out of 4.0. Candidates should be motivated self-starters who enjoy solving challenging quantitative problems in a collaborative environment. Candidates should be quantitative, creative, inquisitive, candid, and entrepreneurial. Because all candidates must be able to hold a Department of Defense (DoD) security clearance, the applicant must be a U.S. citizen. Finally, Candidates should have an interest in contributing to the success of corporate initiatives (e.g., process improvements) that impact Technomics’ performance and health. Analysts Rachael Pascale and Katie Taylor will be attending the Virginia Tech Engineering Expo career fair, and I had the opportunity to ask them a few questions about their career fair experiences and tips for candidates. Q: Why did you choose to accept a position with Technomics? Q: Why is recruiting fellow alumni important? Q: What makes a successful career fair candidate? 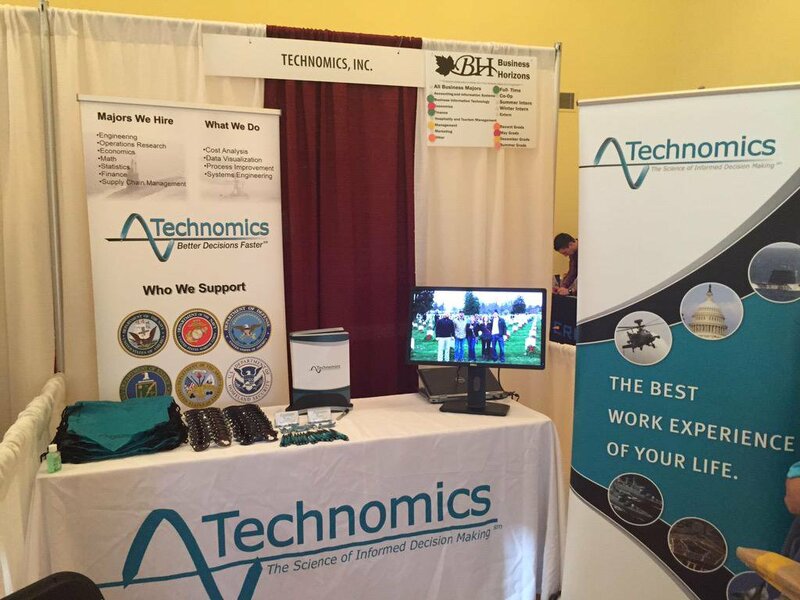 Technomics will be attending the Virginia Tech Engineering Expo 2016 on Wednesday, September 14. The Expo will be held in the Squires Student Center from 10:00-4:00. Review our company profile, and come see us at Booth 208 in the Owens Banquet Room. We will be interviewing talented, qualified candidates from the Expo on Friday, September 16, at the Smith Career Services Building. Fall Career Days at Penn State will also take place the week of September 13-15. Technomics will be recruiting on Tuesday, September 13, at the Non-Technical Full-Time Career Day and on Thursday, September 15, at the Technical Full-Time Career Day at Booth A-04. Fall Career Days are held each year at the Bryce Jordan Center, which will be open to students from 11:00-4:00. Technomics will also be attending the Industrial Engineering Career Fair at the Days Inn in State College on Wednesday, September 14, from 7:30-9:00. We will interview qualified candidates on Wednesday, September 14, and Friday, September 16. Be sure to come prepared by reviewing our company profile. Is Employee Ownership for You? If you think you have what it takes to contribute to company growth and success, we hope to see you at the Virginia Tech Engineering Expo and Penn State Fall Career Days in September. Learn more about employee ownership and Technomics’ company culture on our careers page. If you have any questions about recruiting or our open positions, please contact our Technical Recruiter, Hannah Moore, at hmoore@technomics.net.